Weighty Matters: "A Perfect Portion"
My wonderful wife picked these up for me from the cafeteria at the Children's Hospital of Eastern Ontario. Notice two things - the words, "A Perfect Portion" and the 75g size of the bag. 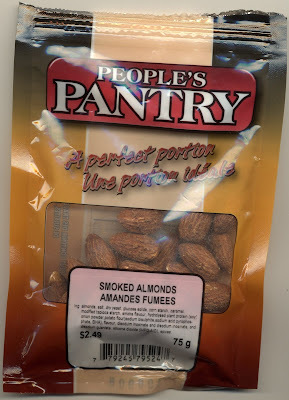 I imagine most folks when buying the People's Pantry line of "Perfect Portions" (they sell lots of different "Perfect Portions" - other nuts, jelly beans etc.) would assume that they were appropriately sized portions. If it is a "Perfect Portion" why is it that the nutritional information is per 40g of the 75g serving? 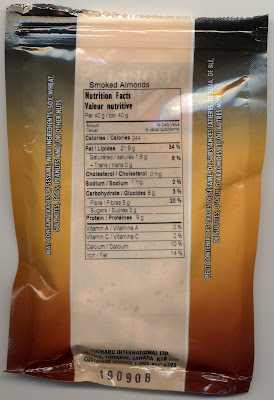 How it it possible that the salt-as-a-second-ingredient, visibly-covered-in-it nuts only contain 1mg of sodium per serving? The lesson here of course is that you've always, always got to read labels to actually know what you're eating. In this case the "Perfect Portion" of nuts, if consumed wholly, would provide you with a perhaps not so perfect 460 Calories (more than a quarter-pounder at McDonald's) and who knows how much sodium.